Day in and day out - you’re sitting (or standing!) in the same office space all day. Our workspace is where we spend the majority of our time, and for way too many people, it is the least comforting ad creative environment they are in all week! We are firm believers in a comfortable, creative, lively work space. It takes some creativity, thought and intention but with a few simple tips and tricks you can transform your office into your own sacred haven. 1. BYOM - Bring Your Own Mug! Bring a mug (or a few) to make your space feel a little warmer. Like a ceramic comfort blanket that carries life juice. Shop this mug at Anthropologie. If you’re anything like the rest of us, you have a drink in hand pretty much all day long. We like to mix it up, coffee, coffee, tea, espresso, water, coffee, matcha… usually in that order too. Bringing a mug is cool too because it reduces your carbon footprint. #WIN Here at PetalFox, we have about 6 mugs stacked up in the office on any given day. Try it! 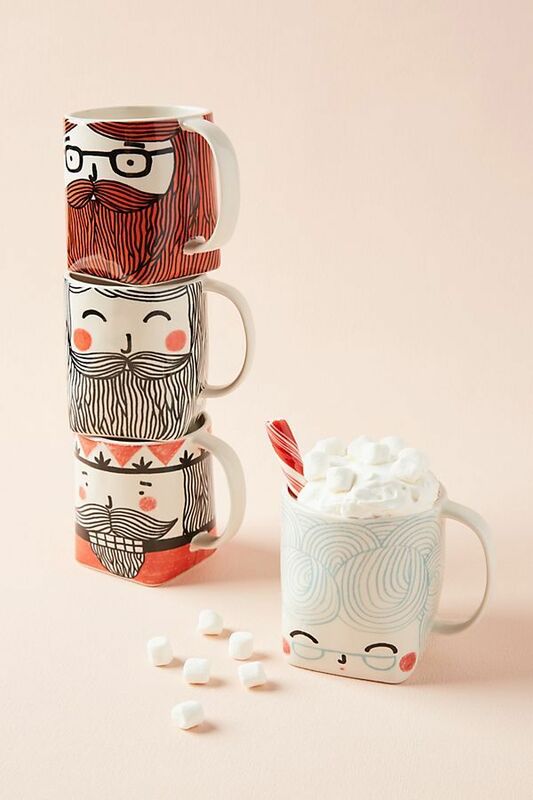 If you don’t want to bring one home, you can order a couple cute mugs from Anthropologie. Shop this macrame from Urban Outfitters. You need some life on those walls! Never underestimate the space behind your computer screen. It was meant for more than just sticky notes and a desk calendar! We are obsessed with not just pretty art pictures, but hanging shelves, macrame, rugs, or beaded wall art in the office. When looking for decor, keep texture in mind and get creative! We love all the hanging goodies at Urban Outfitters, their vibe is 👌🏽 check some stuff out here. BONUS: If art’s not your thing or you don’t have the ability to decorate, check out Mixtiles, an app that turns photos on your phone into 8” x 8” squares for your walls. Arriving ready to hang, Mixtiles are designed to easily be moved and removed from your walls. Perfect for decorating your cubicle wall or a temporary office space. Reset the ambiance with some aroma therapy! We swear by this! Shop Wolf Bone candles here. Any given day you walk into the Petalfox office, you’ll most likely be welcomed by a sweet, grounding aroma. Candles are our everything! While we mix in fresh flowers on all of our desks, we like to always set or reset the vibe with a candle, organic mist sprays, essential oils, or incense. There are tons of options. Check out these candles, oil diffusers, and organic room sprays. Spice it up or channel your zen with the right playlist and listening style. A good pair of headphones is one of life’s most underrated accessories. Perfect for tuning out the ideal office chatter, or listening to your favorite Spotify playlist. We believe having headphones at your desk are an absolute must for staying productive. Whether your choice is air pods, ear buds, or noise-cancelling headphones, you shouldn’t underestimate the power of a comfortable listening tool. Check out these super cute wireless headphones. Order yourself flowers for weekly inspiration and beauty - for you, from you! We’ve spent hours and hours in our workspace, craving something beautiful, feminine and inspirational. Petalfox was born out of the very need to have power and beauty in our workspace. Our arrangements are designed for small spaces, so you can rest assured that while our flowers will brighten up your space they will not overcrowd it. We deliver blooms to your desk or door weekly, monthly, and everything in between. We curate a new arrangement each week that ships on Monday’s. Once you’ve signed up, you can get, gift, or skip your flowers at anytime.